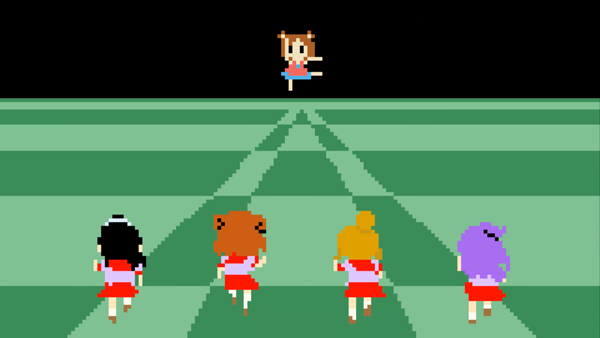 Let’s get the similarities out of the way, visually Ai-Mai-Mi Mousou Catastrophe mostly looks the same. It has the same high points and low points in terms of quality. It did seem like there are more highs that lows, but the show is mostly the same. Also, the opening features an excellent NES style aesthetic with a catchy song similar to the original Ai-Mai-Mi credits sequence. The credits are also simple, but effect use of animated character in a real world setting. The biggest difference in Mousou Catastrophe compared to its first season is its writing and the show's format. The plot of Mousou Catastrophe is that Ai (the one who actually cares about making manga) wins a fighter tournament and gains the attention of a mysterious group of elite manga artists. What do these manga artists want with Ai? Actually, I have no idea. Nothing actually comes out from this scene. Despite the fact that episode one implied that there would me and overarching story line, it's just the same nonsense from the first season. Now, I actually thought the humor of the first season actually got good in the later episodes. However, I cannot say the same for Mousou Catastrophe. It has the occasional funny joke, but as a whole I can’t really say I enjoyed any of the episodes. I just found myself bored most of the time. Upon reflection I think I know the reason for this. The biggest thing holding Mousou Catastrophe is the format. In the original Ai-Mai-Mi, each episode followed the same format: Quick opening gag, title splash screen, episode, and credits. Mousou Catastrophe, however, features the format of quick opening gag, title splash screen, opening credits, episode, end credits, and informational segment. And both seasons features episodes with a 3.5 minute running time. There simply enough time to fit what the show wants to do. 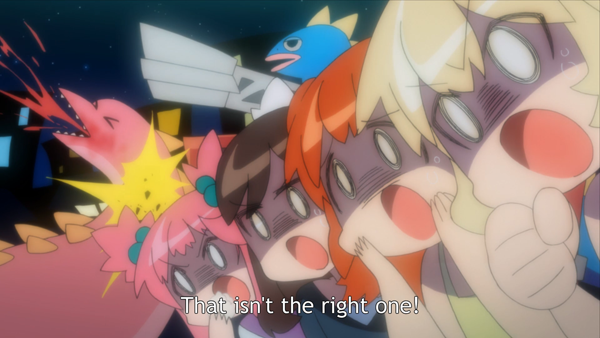 Each episode is so crammed that they sometimes have cut the opening short just to get to the actual episode. At the end of the day, biggest reason I didn’t like this season is because too many episodes felt incomplete. They literally felt like they were being cut short and as a result, some episodes don’t have a conclusion. They just end. Overall, I have to say that I was disappointed with Ai-Mai-Mi Mousou Catastrophe. The first season left me with some high hopes, but all that is gone now. Too much of the show is random and not enough time is available for the stories they’re telling. And most importantly, I just didn’t think it was funny. What I did find amazing was the informational segment at the end of each episode. Sometimes, the dog host just told random stories. 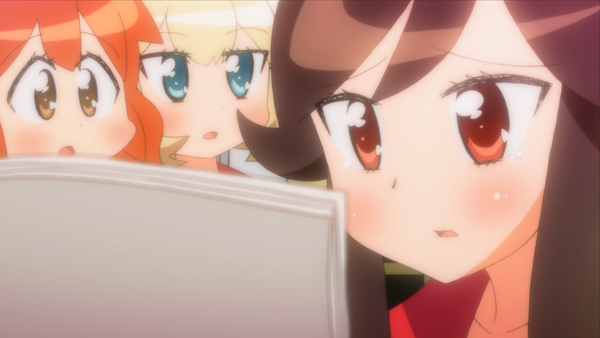 Sometimes she informed us about Ai-Mai-Mi products, such as the blu ray release. What’s amazing is that in one segment, the host told us to buy the manga so read the stories and jokes that the director had to cut. I’ve heard of anime series ending in a way where viewers would read the manga in order to get the rest of the story, but I’ve never seen a show literally tell its viewers to read the manga. Maybe we should. And who knows? Maybe the manga is actually funny. If you’re interested in watching Ai-Mai-Mi Mousou Catastrophe, you can officially watch the show on Crunchyroll.